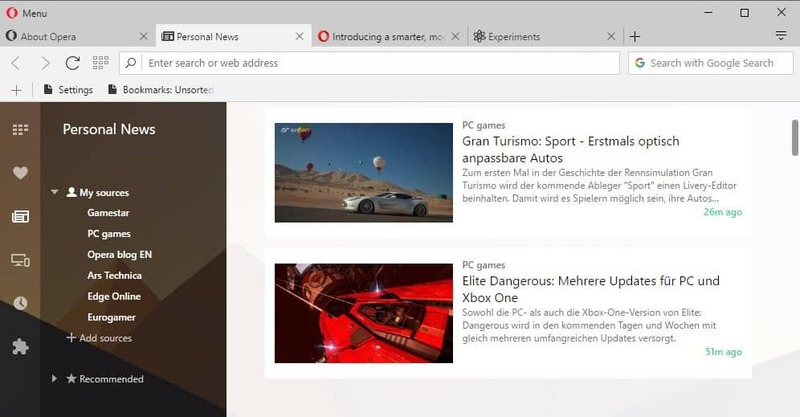 Opera Software continues to push a news feature in the company's Opera web browser. It plans to release an update to it that gives users more choice when it comes to the selection of news sources in the browser. The personal news feature update, showcased for the first time in yesterday's Opera Developer edition update, makes news more personal. Previous versions of Opera featured only general news types such as gaming, arts or technology but little to no control over the news sources displayed on the new tab page. Additionally, it was not possible to select news from different regions, and all that was offered were local news sources. The new personal news feature changes that in several important ways. When you open the news feature for the first time after upgrading Opera to version 39, by opening a new tab and selecting the news icon, you will get a prompt with suggestions for news sources. Opera uses the local browsing history for the suggestions and notes that the history data used by news won't leave the local computer. You may select none, one, some or all of the suggested sources, and news are pulled and displayed afterwards in the interface in chronological order. The left part of the screen lists all sources, and you may click on any of them to display only news from that source. This works similar to how RSS feed readers operate, only that you are restricted to a single main folder (so no tech, gaming or football folder with multiple sources each). You can remove any source with a click from your feed, and click on the add sources link to browse available news sources and add them to your list. Sadly, Ghacks is not listed as a source but the usual suspects are (think big newspapers, big corps, big sites). While Opera Personal News is based on RSS, it does not allow you to add sources of your own. That's not a problem if you like mainstream news, but if you prefer independent news or information, you won't find those there. The add sources option offers another new feature. You can now select one or multiple languages or regions for news sources, and the search that is provided as well searches across all sources regardless of language or region. This means that you can finally break out of the regional news restrictions of the current news implementation. The new personal news feature is a step in the right direction but it still falls short in many regards. Apart from offering only a limited number of news sources, it is the two layout choices that limit how you access news in the browser. News are either displayed as wide blocks with each taking up all horizontal space, or in a rectangular layout that is all over the place. There is no option to display only news headlines for fast browsing, and no option to turn off images to save bandwidth. RSS feed services on the Internet are superior to what Opera is offering. While you may spend more time configuring the service and adding sources, you end up with a personalized news frontend that delivers exactly the news to you that you are interested in. I'm not saying that some users won't find the Personal News feature useful, but those who want more control over sources and layout, will probably say pass for now and use superior solutions. Opera 39 will ship with a personal news update that delivers better news sources selection as well as other requested options such as mixing news from different regions. stop beating chines dead body. Too bad that Opera started to launch useful features when they’re now being sold to a Chinese company. Otherwise i would gladly try this and other features that they added a couple of weeks ago. 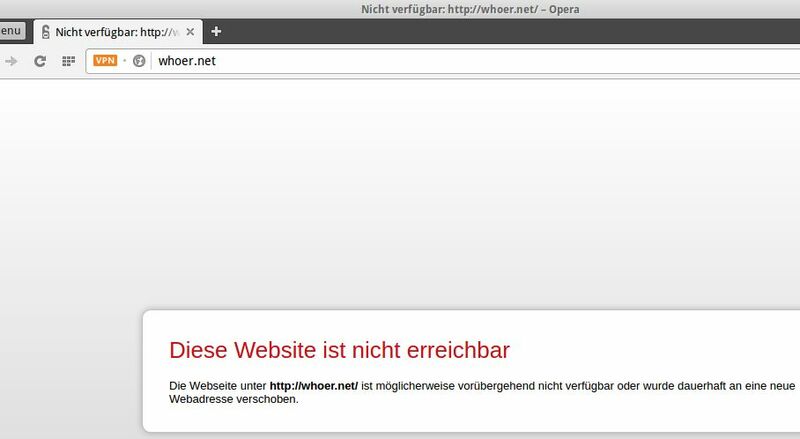 Opera is not sold to a Chinese company. However, the text of the original bid states that the offering has to achieve a minimum acceptance level of 90 percent of the total stock for the takeover to happen. The offer expires next Tuesday afternoon, May 24, central European time. Thanks for the information. Let’s see how it ends then, they still can reach those 90% minimum. Evil Commies was a Buzzword 50 Years ago. Useless since you cannot add your sources. This is in the Opera Developer stream and they update and make their features better in time it reaches the Stable build. They also improved the Ad-blocker by allowing custom lists(that wasn’t possible when the feature was announced) and then improved the VPN handling (like WebRTC leaks, etc). They will improve on this as well, so the closing words were a bit harsh since you didn’t provide context for this. This is developer stream where features aren’t even guaranteed to make the final cut. the VPN in actual 39dev, which isn’t a real VPN but a Browser-proxy-vpn, seems to be buggy.